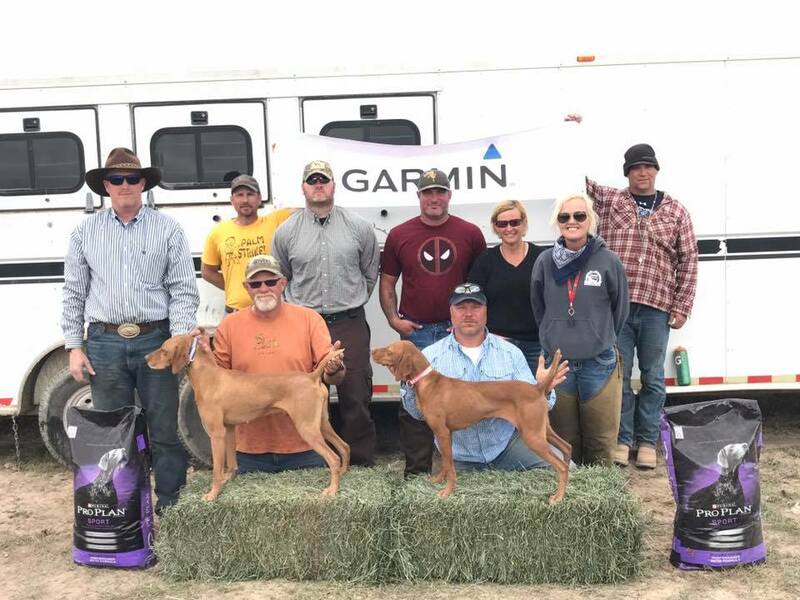 The 2017 National Vizsla Association, which includes (Western Shooting Dog Championship, Mortensen Derby Classic, National All Age Classic), were once again held at the iconic Twelve Mile Pass grounds outside Fairfield, Utah. Participants and spectators saw everything from beautiful springtime weather with sun and a light breeze, with temperatures reaching the low 60’s, to an intermountain west treat with severe winds over 60 mph, and snowfall. Handlers and dogs must be able to adapt to conditions quickly for the weather in the west during the spring, as it allows only the toughest to prevail. As usual, we have many people to thank for making this event possible. At the top of the list of those to thank for the success this NVA Western Event are our tremendous sponsors, Purina and Garmin. Thank you so much for all you do for us, the NVA is proud to be associated with such quality brands. Purina and Garmin truly are the best. Next on our list of those to thank are our judges and volunteers. We’d like to thank, Mr. Guy Mollicone from Surprise AZ, who graciously filled in on fairly short notice for an injured judge. Guy judged both the Shooting Dog Championship and National All Age Classic. We’d like to thank, Mr. Marty Middleton from Bluffdale UT, for judging the National All Age Classic. Marty is considered a premier judge in the region and we are grateful for his contribution. We’d like to thank Brett Burgi from Salt Lake City UT, Brett judged the Mortensen Derby Classic for us. A special thanks goes out to Mr. Brandon Johnson from Richmond VA for filling in in for Matt Solt from SLC, who was unable to perform his judging duties. Brandon judged both the Western Shooting Dog Championship and Mortensen Derby Classic. We cannot thank him enough for dropping everything last minute and hopping on a flight to Utah to judge our event. Brace 1- Durite’s Katy Kat, owned by the Sunderlands, Handled by Carrie Syczylo. Rockwood’s Pole Dancer “Enzo”, Owned by Mike Northwood. Handled by Robert Tomczak. Katy was picked up early she was not pleasing her handler. Enzo had seven finds and was staunch on all his bird work, but did not have the race to push the leaders. Brace 2- Burr Oak’s “BamBam”, Owned by Jim Gingrich. Handled by Brian Gingrich. Diamond C’s Blast From the Past “Gabi”, Owned and Handled by Chris Corliss. BamBam had a very nice snappy and animated race. She recorded two finds, one on the front of the course and one on the back. She showed very nice style and manners. Bambam was rewarded Runner Up Champion for her efforts. Gabi was picked up early for breach of manners on birds. Brace 3- P.F. “Blaze”, Owned by Damon Daniels. Handled by Robert Tomczak. CK’s Touchdown Guy “Guy”, Owned by Ron Chenoweth. Handled by Brian Gingrich. Blaze recorded three very nice finds and was staunch on his birds. Blaze hunted very smartly but lacked the race of the top dogs. Guy was very forward while powering to the front, he disappeared several times. On three of those occasions, he was found standing on a bird. Guy showed great class and style on his birds. Guy was rewarded Champion for his efforts. Brace 4- CK Too Hot To Handle “Cayenne”, Owned by Bryan Adams. Handled by Brian Gingrich. Diamond C’s Ruby Jewel “Ruby”, Owned and Handled by Chris Corliss. Cayenne did not have her running shoes on this day, but this talented young dog has a bright future. Ruby was very determined to find birds, and she did. Her bird work was staunch but she hunted to a much slower pace than was required for this stake. Brace 5- Burr Oak’s Taza “Taza”, Owned by Jim Gingrich. Handled by Brian Gingrich. Durite’s Hoosier Man “Hootie”, Owned by Paul Gryce. Handled by Carrie Syczylo. Taza was picked up early. Hootie tired dramatically in the warmth of the day on the second half of the course. Brace 6- Bangert’s Red Baron “Red”, Owned by Pat Bangert . Handled by Brian Gingrich. Diamond C’s Recon “Recon”, Owned and Handled by Chris Corliss. Red did not complete the hour. Recon started and finished the same way, he hunted extremely well and showed intelligent application. He had three evenly spaced finds, and showed a lot of grit in the heat of the day. Recon was given and Award Of Merit by the judges for his effort. Brace 7- Ramblin Rivers Rollin “Stone”, Owned by Bill Stapleton. Handled by Brian Gingrich. Durtie’s Indiana Jones “Jones”, Owned by Greg Soderberg. Handled by Carrie Syczylo. Stone was picked early for a breach of manners. Jones did not finish the hour. Brace 8- Burr Oak’s Scout “Scout”, Owned by Jim Gingrich. Handled by Brian Gingrich. JB’s Nothing Runs Like a Deere “Johnny”, Owned by Chet & Jodi Beckley. Handled by Robert Tomczak. Scout did not complete the hour due to a mistake on a bird. Johnny had a breach of manners by the side of the hill on the front part of the course. Brace 9- Hillbillies Omaha Hero “Dutch”, Owned and Handled by Josh McPherson. Meyer`s Bella “Bella”, Owned by Todd Meyer’s. Handled by Carrie Syczylo. Dutch showed superior power and ground speed. He had a covey find at the base of the hill by the lone tree. He had another covey find in the sage brush patch near lost dog canyon, but unfortunately a third covey did him in. Bella recorded some finds but was picked up early for not pleasing her handler. Brace 10- Hillbillies High Noon “Cowboy”, Owned and Handled by Bonita Austin. Burr Oaks Ellie Mae “Ellie Mae”, Owned by Jim Gingrich. Handled by Brian Gingrich. Cowboy was picked up early for a breach of manner on birds. Ellie Mae had a find but did not push the top dogs. 1st place went to CK’s Nitro, Owned and Handled by Carrie Syczlo. Nitro ran big, reaching the All Age Standard, Nitro was forward far to the front. The judges awarded Nitro 1st place on the merit of his outstanding finish. 2nd place went to Hillbillies Standard “Gauge”, Owned by Lisa Riddle. Handled by Robert Tomczak. Guage took advantage of a break in the wind, he recorded three finds and showed great style and intensity. Gauge reached an All Age Standard and finished very strong to the front. Gauge was rewarded with 2nd place for his efforts. 3rd place went to Searle’s Copper “Copper”, Owned by Nate Searle. Handled by Josh McPherson. Copper showed blistering ground speed and extreme range to the front. The handler, McPherson, was barely able to hold on to him. He was just seen on the edge at the very, very far objectives. After a very lengthy absent to the front, Copper made an appearance on the wrong side of the fence near the mound in the middle of the course. It took some doing but the handler got the dog back to the front before time. This hiccup cost perhaps a higher placement, but it was still an impressive run nonetheless. 1st place- CK’s Touchdown Guy “Guy”, Owned by Ron Chenoweth. Handled by Brian Gingrich. Guy had a strong forward all age race and finished very nicely down by lone tree hill. He recorded two very stylish finds, one at the 20 minute mark and one at the 40 minute mark. Guy was awarded 1st place for his efforts. 2nd place- Ramblin Rivers Rollin Stone “Stone”, Owned by Bill Stapleton. Handled by Brian Gingrich. Stone was consistently forward and strong throughout the hour. He had a find by Stonehenge at the front part of the course and one by the saddle on the back. He was awarded 2nd place for his efforts. 3rd place- CK’s Red Baron “Red”, Owned by Pat Bangert. Handled by Brian Gingrich. Red had two very nice stylish finds showing high class on his birds. Red had some pockets of brilliance with a few spots of inconsistency which probably prevented him from a higher placement.